Three-Year-Old Champion Appaloosa Terrific Chips Mirage and and Youth Owner and Exibitor Miranda Dunn Are a Winning Combination! "Terrific Chips Mirage, aka Tex, is doing so well for Miranda! We put in for NAERIC Advantage award dollars on him; it will be a nice winning for her. The money goes away into a fund for university for Miranda in four years. She is grade nine this year. 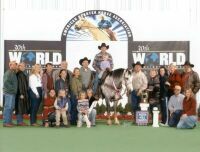 It`s worth noting that the 2008 Canadian National Appaloosa Horse Show was only the third show Tex has ever been to in his life and he was ridden by a Novice Youth rider, Miranda Dunn, who has only been showing for two years! We would like to say thank you to Tex`s breeders, Kevin and Julie Bridgeman, and NAERIC, for the NAERIC Advantage fund. It will definitely help provide for Miranda to attend university when she finished high school in four years. Tex and Miranda are a definite winning combination! I bought Sully from Lynn Burgess of Bonnie Lock Acres in the summer of 2005. He was a gawky tall yearling and I fell in love! I had never started a youngster myself so Lynn offered that I keep Sul at her farm and she helped us through the Level 1 Parelli ground work, 3 days a week for the first month. That month of training gave me a new appreciation for working with horses, and I think of Lynn everytime I recieve a compliment on Sul`s perfect ground manners and respect for people. It was her training that developed the strong foundation that has created, in my opinion, the most responsive, trusting, reliable steed I have ever worked with. He will do anything and go anywhere for me! Now we are living in Toronto, Ontario, working on our dressage in preparation for a career in eventing. The picture shown was taken August 1, 2008 at the Caledon Hunt Club, during the Mimosa Cup. His relaxed happy nature and confidence on the trail during the Hunter Pace event confirmed that he is perfect for eventing. If he was a little smaller, (he stands 17 1hh at 4 yrs!) I could probably say he`d be a great western mount as well, he is just such a great, all around horse! Thanks Lynn!! All the best! " "I am sold on NAERIC horses! We compete in horse shows and the fabulous NAERIC program that pays supplemental dollars when we are successful allows us to expand our breeding program. I will not hesitate to purchase NAERIC horses because of their high-quality and reputable breeders." 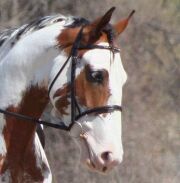 "Love Letter, better known as Vinnie, is my 2002 CanAm Sport Horse! Vinnie was bred by equine rancher Dennis Stiles,is out of a paint draft cross mare and is sired by the Thoroughbred stallion, Northern Secret. I am, on a daily basis, just blown away by Vinnie! Being a self-proclaimed horse snob, I`m constantly in awe of this guy! I have shown hunters for about 30 years, and in the last few years have begun to judge locally. I have always liked and appreciated a nice horse and Vinnie is just outstanding. He`s very conformationally correct. He has nice straight legs, great bone and very, very nice feet! He has a lovely, well-set neck and a very Thoroughbred looking head. His eye exudes kindness. His movement is exceptional, being very flat kneed and suspended. For all his lovely physical attributes, none compare with his mind. He is truly like an old settled horse in a 3-year-old body and has been since I purchased him as a 5-month-old colt. He is willing and accepting of everything including the vet, farrier, bathing, being trimmed, hauling, going to shows� he`s just good about it all. As much as I would like to take credit as some super trainer, it`s not me, it`s him. Without a good breeding foundation, he would not be the horse he is. I am truly blessed! I would not hesitate to purchase another CanAm Sport Horse." "I wasn�t sure of the quality you might get, and bringing a foal all the way from Canada seemed expensive and too complicated to make it worthwhile. Now I�ve gotten two APHA registered Paints (from equine ranchers), and I�d love to get another one! The quality of these two is high, and the free transportation provided through the Equine Placement Fund (EPF) program this past year makes it just that much easier. These PMU horses are very nice!" "We have been buying NAERIC CanAm Sport Horses for about 6 years now, many of them have gone onto show in the dressage arena along with jumping, eventing and fox hunting. Our clients stay in touch with us and send us their "win" pictures. These horses prove to be athletes, competitors, companions and partners! Many claim they would not sell them for anything, they have found their "Dream Horse". The ranchers we work with, know us now and know what we are looking for, this makes the whole buying process easier. The horses are getting better and better. Through the CanAm Sport Horse site, buyers can view more horses and meet more ranchers, this site has helped us with our search for that special horse.� Thank you NAERIC for all your support and information you have supplied us through the years! " "Whisper is doing really well. I just moved her back to NJ last week for the fall semester. She is living at San-Sue Acres in Farmingdale, NJ. They have other babies there that are her age, and she seems to be adjusting well. She really is a great filly!" "I received checks today from NAERIC, thank-you. I have attached photos of what was delivered and now 10 week later photos. They continue to grow like weeds and are doing great! I`m glad I could give them a good home and they could give me what I needed; good company and a new horse project and I thank NAERIC for helping with the placement of these animals.�"
"I�ve been buying and selling PMU horses because of their size and overall quality. Plus, because the EPF, Inc. (Equine Placement Fund) program helps with the moving and veterinary costs, I can get good horses at good prices." "Four years ago, I bought my first sport horse from a NAERIC-member ranch and every year since then, I�ve gone back to buy more. The first time I went to a ranch, I saw that the horses were well- bred and cared for and had the potential to be very successful in competition." "As equine ranchers, we are proud of our home-raised NAERIC registered eight-horse-hitch. The NAERIC program that pays supplemental funds sure help with the expense of showing, promoting and selling horses!" "I have purchased many half and three-quarter Thoroughbreds from NAERIC-member equine ranchers. These horses have good minds and bodies. I have placed them in fox hunting barns, hunter and three day event barns. They make first-class sport horses for the American market." 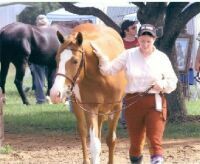 "We have purchased, trained and resold many NAERIC draft horses, and have also competed against them in the show ring. What we consistently see is the quality and value NAERIC draft horses offer for every level of buyer and competitor." "My experience with our three PMU horses has been extremely rewarding both from a learning point of view and from an emotional point of view. They have easily made themselves part of our family and in the coming years will provide us with many years of enjoyment. "